Watch out, Foursquare–you may just be the leading location-based “check-in” game out there, but there’s a big player eyeing your turf: Facebook. Zuck’s about to step to you. And he’s got a posse. Rumors are swirling that Facebook is finally going to be getting into the location information arena, adding in the ability for users to geotag their status updates–possibly this month. Whether or not this will come with an official Facebook-coded “check-in” facility is unclear, though if it did it would be an instant and serious challenge to location-based systems like Foursquare or Gowalla simply due to the hundreds of millions of folks that log in to Facebook on a daily or hourly basis. At this point, Foursquare will seriously need to up its ante in order to differentiate itself from Facebook, which may involved grabbing even more high-profile advertising check-in partners. But it’s also possible that this argument is moot: Whether or not Facebook itself adds in a check-in API, third party Facebook users will certainly be able to make the most of the location-based services and craft their own login/check-in systems. Which might actually be a bigger threat to Foursquare, as playing in the market like this gives these third party companies a degree of control over their LBS game that they wouldn’t necessarily have as a Foursquare partner. One big rumor in this area, as an article at AdAge highlights, is about McDonald’s. 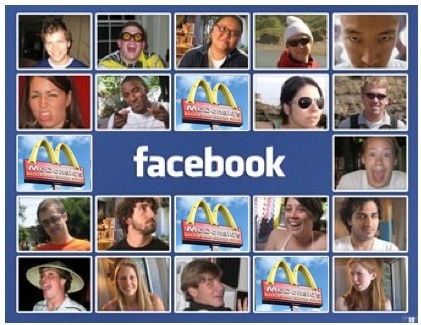 This industry giant is apparently primed to build an LBS game into its Facebook presence as soon as Zuckerberg’s company enables the system (thanks to some behind-the-scenes business shenanigans that ensured a close tie between Facebook and the Golden Arches). Fast-food eaters would be able to check in to their particular restaurant’s digital presence, and get the usual sort of LBS rewards like badges, but also get tailored advertising and maybe even location-based special offers on certain food products. Facebook could be massive threat to the LBS games merely by enabling simple location-awareness and flexing its big-money advertising muscles to attract high-profile LBS-based advertising partners. Also worth considering: Facebook’s lamentable heritage in security and care of user’s private data. With a big leak this week which let other users easily see data you may prefer to keep private, and remembering Facebook’s dictatorial stance on what it considers is your rights over your own private info, would you really be happy trusting the social net giant with to-the-minute data on your geolocation? Two things immediately spring to mind once you consider this–it won’t be long until the first Facebook geo-stalker case hits the headlines, and that will be closely followed by lawsuits accusing Facebook of playing fast and loose with users’ geo data.